how can you forget love? could i stay the honest one? Swimming in a sea of memory, a heart filled with a mixture of pain and joy . . . existential tales of memory, fear and desire set upon dense electronic sounds as calm ambience confronts pained emotions. Powerful, touching vocals from Julianna (of Skinner Box) strongly complement Oscar’s searing voice and Vicki Richards’ snake violin. “Songs of tragic beauty. Often moody and foreboding, soaring to incredible tonal levels. The vocals are clear and sparse, laden with emotion and intrigue.” – THE GAVIN REPORT. “This is beauty with an edge, perhaps even a slightly desperate air.” -WHOLE EARTH REVIEW. 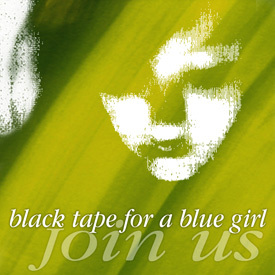 “Black Tape For A Blue Girl is a treasure of a band. Their sound is lush, full and beautiful, which is not to say wimpy. This is beauty with an edge, perhaps even a slightly desperate air. Vicki Richards supplies sensuous violin lines. Recommended.” -SAN FRANCISCO CHRONICLE. soaring to incredible tonal levels. The vocals are clear and sparse, laden with emotion and intrigue. Certain to satisfy the neo-classical afficionado.” -THE GAVIN REPORT. “This is more of that unexplainable type of lacy textured, swaying music. more of an emotional depth, more of a real despondency.” – BSIDE. There was a period of time during the mid-1990s where Projekt Records was my favorite record label (or pretty close to it). It was a pretty emotional time, filled with near-poverty, relationship upheaval, and no small amount of existential angst. Projekt’s dark, atmospheric music — as typified by such releases as Soul Whirling Somewhere’s Eating the Sea and Black Tape for a Blue Girl’s Ashes in the Brittle Air — provided those days with a suitably melancholy and overwrought musical backdrop. Over the years, Projekt has expanded beyond their initial 4AD-esque “darkwave” niche, and have released everything from ambient and world music to cabaret and apocalyptic folk. Personally, though, I still prefer Projekt’s darkly atmospheric side — I still consider Eating the Sea one of my favorite albums — and the label has recently re-released one of its earliest darkwave releases. A Chaos of Desire was Black Tape for a Blue Girl’s fourth album, and was originally released in 1991. Since then, it’s gone out of print, and rather than spend the money to reissue it on CD, Sam Rosenthal (Black Tape for a Blue Girl frontman and Projekt founder) has decided to release it for free (for an e-mail address, that is) on Bandcamp. The twelve songs on A Chaos of Desire move from dark explorations of love and heartache (which often feature Oscar Herrera’s melodramatic vocals) to softer, more ambient pieces that blend Rosenthal’s synths with fragile string arrangements (e.g., “Beneath the Icy Floe,” “Of These Reminders”). As you might imagine, I prefer the latter, as they provide a perfect example of Projekt’s “vintage” darkwave sound. #37: Melancholy streams of electronics and strings, with either floating female vocals or gothic male intonations – reminiscent of certain Dead Can Dance pieces (especially guest vocalist Loren’s reading of the title track), although without the mysticism, scholarship, and anachronistic plunderings. These pieces are contemporary interpretations of the gothic mind set, and the lyrics are often maudlin and self pitying: try “shine shuddered light into my eyes / I cannot escape, unending lies” from “The Hypocrite Is Me.” The music itself is a pleasant depressive drone, and certain songs – “Pandora’s Box,” with its busy rhythm, guitar, and Roxy Music-like melody, and “Tear Love From My MInd,” with its piano highlights and SkinnerBox’s Julianna Town’s fine singing – are good listening no matter what your genre preferences. Believe it when I say that listening to this album with leave you motionless, in a dreamlike state of mind. Its atmosphere is so intense, it makes you feel like you’re dreaming. A Chaos Of Desire represents exploring the possibities between gothic, classical, and ambient music. What most of this LP enforces is thought of tranquility translated through musical mean. It’s melodies are full. Vocals are very opera-like but concise and haunting. It’s underscore is definitely peaceful. It’s not often that collections like these appear in such full context of simplicity in thought and manner. Death in June and Current 93 are both examples of comparisons, but what makes this collection different is that it’s feel is more relaxed and ethereal instead of religious or malevolent. What is most impressing is that live and electronic instruments work hand in hand along with the opera-like vocals which is rarely seen in any ambient or gothic music collections. A Chaos Of Desire is an ambient texture full of glory, and peace with instrumentalism. In many ways the sister release to Ashes in the brittle air, down to the similar cover art and the parallel sources of inspiration (the Paula thanked in Ashes‘ liner notes for “caring inspiration” here gets credit for “destroying my faith”), Chaos ratchets up the lyrical intensity even more strongly than before. Given how intense Rosenthal generally is anyway with his words, this may seem a hard task to accomplish, but one listen to the lengthy, majestic album centerpiece, “The Hypocrite Is Me,” will confirm it — Herrera delivers a lyric of deep self-loathing with command, while the music backing him is an intense series of rumbling electronic tones matched at the end by a great, gently reverbed violin solo from guest performer Vicki Richards.